You never know what you’re going to get with a new signing from the Bad Elephant. That’s exciting. I first heard music from this band when their song Little Funerals appeared on the Bad Elephant Music Christmas 2015 Sampler. I liked it but I have to confess that I wasn’t, well, blown away. Even so, I enjoyed the track and the album went on my infinitely expanding list of ‘Albums That I Must Buy Eventually’ (or ATIMBE). Here I am, half a year on and listening to the whole album, and it isn’t what I was expecting. You cannot judge this album or band by any one track. When I want to pick up an instrument and start playing along to a record it must mean that something in the music has spoken to me. In fact, I was in danger of not getting past the first track because I had it on repeat for a while. The song has that elusive quality, it has “it”. I suspect some bands actively strive for “it”; and fail to capture “it” because they try to find that elusive quality by emulating those who do have “it”. Whatever “it” is. Anyway, I’d picked up my Stick [EDITOR: where are you going with this, Phil?] and was playing along to the bass line of Background Noise, the first track, before you could say ‘Emmett Chapman’. [EDITOR: oh that bloody thing. You’re so one-dimensional]. When I finally remembered I was supposed to be doing a job here I found that I was, thanks to the rather splendid opening track, listening to Little Funerals with a fresh ear. Luckily there is plenty of room in the freezer for fresh ears since we moved the bodies and ate all of those out of date burgers. And now that fresh ear has a worm in it, namely that bit of guitar tapping, and I keep whistling the bits played by strings. Presumably these are the St. Reatham Strings. (I used to live in Norbury, just down the road from St. Reatham). 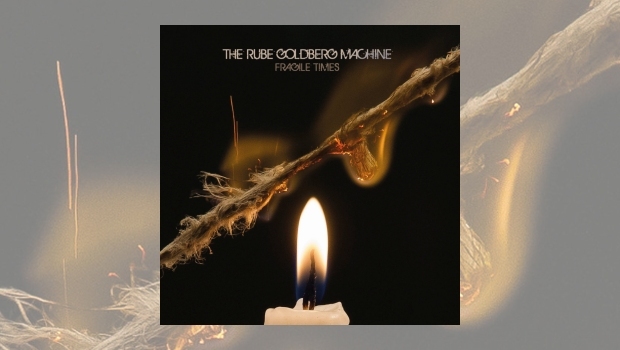 Bad Elephant’s Bandcamp page tags The Rube Goldberg Machine as ‘Progressive Rock’. So is this a “Prog” band? Yes. And no. Mostly no. But are they progressive? Most certainly, Yes. 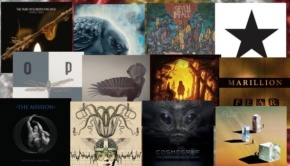 I heard elements – perhaps influences – that reminded me of other bands who are tagged as Progressive Rock who I like, but not all of the music on this album fits neatly into that winkie-hole. By the time I’d got to Man of Glass I was wondering whether this band was writing songs without any respect for genre. A band with a multiple personality disorder. How refreshing! Anyhow, don’t confuse “hearing elements” with “sounds like”. Sometimes melodic fretless bass lines. Sometimes simple but driving bass lines. The occasional unexpected chord change. Keyboards being used as the foundation of sound, like the grid behind that snaps the music to it. Polyrhythmic bits sneaking in here and there. A slightly exotic instrument not normally associated with rock music. Somewhat brave, effective and naked vocals. Songs made of distinctive parts that bleed into each other seamlessly. Variety…but not in an “Arthur-Askey-singing-a-duet-with-a-dancing-poodle”, “Danny-La-Rue-Chinese-Acrobat-On-Ice” way. So is that progressive rock? If you accept the check list then try checking it against the album, then you can decide. But if that list does define the genre [EDITOR: It doesn’t. You’re a nimwit], and I think it does [EDITOR: …], then the Rube Goldberg Machine are definitely Progressive Rock. Or you could just try buying the album and seeing if you like the music! My favourite track kept changing the more I listened. Background Noise never became background noise, I simply kept finding other things to be interested in as I listened. In Symmetry is my favourite song as I write this bit – but I’m pretty sure that will change as I type and listen. It seems to have all the bullet-points above plus loads of harmonics and I think that might be Mellotron. I bloody love Mellotron. And now it is Background Noise again. (See, I didn’t actually write this all in one go)! So just why is Little Funerals my favourite track? Well, it is pretty catchy and jaunty but it mentions funerals so is ironic. And In Symmetry just has “it”. I may not have “it” any more, but The Rube Goldberg Machine definitely has “it”. Note to TRGM – Owen Martin is not credited as a band member but, gentlemen, he compliments the band perfectly. Owen Martin has got “it”. Just saying….